If you’ve been in an automobile accident, we’re able to evaluate you to make sure there’s no underlying damage, even when you might not be in any pain. Our streamlined systems, allow us to see you on the same day you’re in need of an emergency appointment because of an auto accident. Our Castro Valley auto accident chiropractor will provide you with a comprehensive evaluation. This evaluation for auto accident victims is slightly different than a regular chiropractic examination. We’ll do a few additional tests to look for instability in your spine and neck. We will be gentle as we look for signs of whiplash. More focused X-rays will be taken on your neck to check for damage. We need to be sure you don’t need to go to the hospital for immediate care and that chiropractic care can help you. Sometimes it can take two to three months for deep tissue swelling to get bad enough for your pain to start. At that point you might not realize that your pain was caused by the past accident. Even in a 5 mph impact, your soft tissue becomes damaged. When you’re in the car, you take some of the damage from the impact as well. Your body is held in place in the seat by your seatbelt, but your head and neck are not. As the car is hit, the force sends your head flying in one direction, causing damage straight to your muscles, nerves and bones in your upper back or neck. If you’ve been in an auto accident, we will be happy to help you with any billing concerns. Most cases are handled with NO out of pocket expense to you. 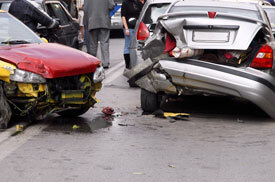 We will bill the auto insurance for you or give you an attorney referral if necessary. Don’t put off visiting us if you’ve been in an accident, even if you may be feeling okay now. We’ll help prevent your pain down the road!